Everyone falls in love with these melt-in-your-mouth, buttery crisp, shortbread cookies with a beautiful (and delicious!) glaze. If you type “shortbread” into The Café search bar (over on our sidebar), you might just get the idea I’m a shortbread fanatic when you see the results. Guess what? You’d be right! I flipped over shortbread as a child, with my first taste of the famous Girl Scout Shortbread Cookies. Later, when I became more sophisticated at 10 or 11 (haha! ), it was the wonderful Scottish cookies in the red plaid package that had me smitten. When I got older and learned how easy this delicious concoction was to make, well, let’s just say I was thrilled. And I’ve never quite gotten over it . I love the simplicity of shortbread ingredients – just butter, sugar and flour. But I’m also quite taken with the many variations and flavors shortbread can take on. I’ve made Lemon-Blueberry, Pumpkin, Candy Cane, Valentine, Salted Caramel, London Fog, Peppermint Bark, Rosemary, Orange-Pecan, Vanilla Bean.,.. I’ve patted shortbread dough into pans and cut it in wedges, rolled it out and used it for crusts for tarts and bars. I’ve done French, Italian and Scottish versions and lots more. I’ve even decoupaged pansies onto shortbread cookies! See what I mean? A bit of a shortbread nut! 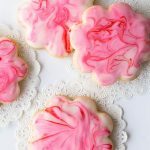 With Valentine’s right around the corner I thought I’d share a delicious cutout shortbread recipe with an easy glaze (that looks anything but easy). It’s a technique you’ll be able to use again and again throughout the year, for special occasions, as well as gift giving. A little bag or box of these pretty cookies would be a perfect way to say, “Welcome to the neighborhood.”, “Thanks for caring.” or “A job well done!”. The cookie dough comes together really quickly with an electric mixer. You then chill the dough for 15 minutes, which also allows the glutens in the flour to relax a bit, making the dough easier to roll out. The dough needs to be rolled fairly thick so it’s nice and even for a pretty finished product. That’s not always so easy to do (definitely not one of my fortes). But I have a little trick that makes it a breeze. Just pick up a 3/8 or 1/4-inch dowel. You can find these at most hardware and big box stores like Home Depot or Lowes. They’re also readily available at craft stores. They come in 36-inch lengths, but will need to be cut in half so each one is 18 inches. Home Depot will cut them for you right at the store, but you can also cut them yourself with a small saw. So what do you do with the dowels? I was hoping you’d ask! You use them to roll the dough to a perfect even thickness by placing them along side the dough on either side, as you roll. Scott was kind enough to take a few pics while I was rolling out my dough to demonstrate exactly how it’s done. The dowels keep the rolling pin at the perfect height. We also took a few pictures of the easy icing process because… well just because pictures speak a thousand words. They say that seeing is believing and I wanted you to know just how simple this technique is! I’ve never been much of an artist when it comes to drawing or painting. My kids and grandkids laugh, because years ago, I mastered how to draw a super simple pig – and that is my artistic claim to fame! But I feel like quite the artiste (and you will too) when I pull each cookie out of the swirly bowl of icing. Each one is truly a masterpiece! This would be a wonderful project to do with kids. Let them have fun with the dough and pretty glaze. Bag up a few and send them to a neighbor or friend who could use a bit of encouragement. 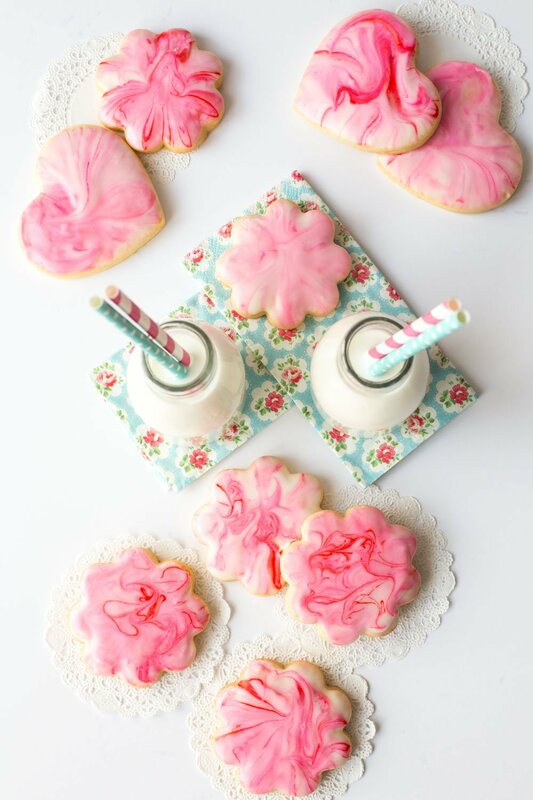 Take a picture of your cookies and post it on Instagram with the hashtag #cafesucrefarine. I can’t wait to see your crazy beautiful creations! Happy Valentine’s Day from the two love bugs here at The Café! 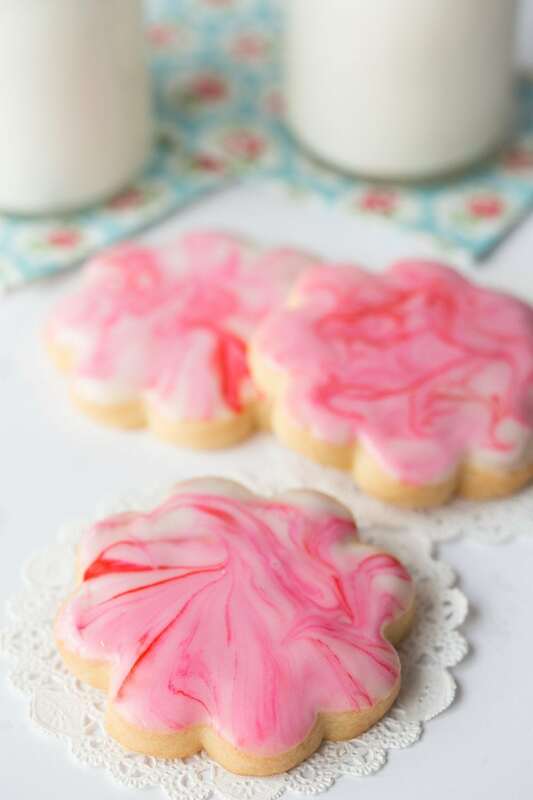 Glazed Shortbread Cutout Cookies - melt-in-your-mouth buttery crisp shortbread cookies with a beautiful (and delicious!) glaze. For the cookies, preheat oven to 350˚F with the rack in the middle of the oven. Line two baking sheets with parchment paper. Beat softened butter in the bowl of an electric mixer until soft and fluffy. Add powdered sugar and vanilla and beat until smooth. Add flour and salt. Beat just until all flour is incorporated. Make sure there’s not dry flour at the bottom of the bowl. Remove dough and unwrap. On a lightly floured surface roll out the dough into a 1/4 inch (.6 cm) thick circle. I like to use 3/8 or 1/4-inch dowels on either side of my dough as I roll it (pictured above in the post, the 1/4 inch will be thinner). This keeps the dough at a perfect even thickness. 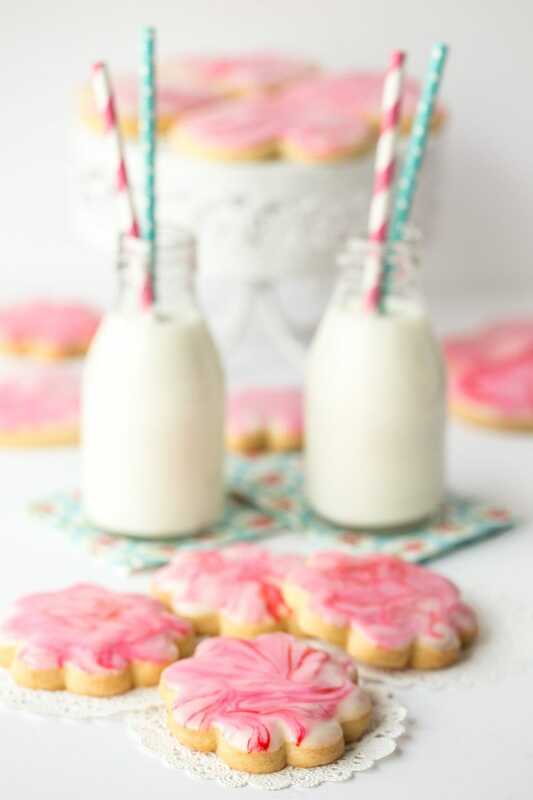 Cut into rounds or other shapes using a lightly floured cookie cutter. Place on the prepared baking sheets and place in the refrigerator for about 15 minutes. (This will firm up the dough so the cookies will maintain their shape better when baked.) Bake for 15-18 minutes, or until cookies are lightly browned at the edges. If your oven does not bake evenly, exchange the pans on the racks half way through baking time. Cool cookies on a wire rack. To make the glaze, combine powdered sugar, vanilla, almond extract and 3 tablespoons of the milk in a medium large bowl. Mix well and add more milk, one teaspoon at a time until a thick but drizzle-able glaze is formed. Transfer half of the glaze to a small bowl (like a soup size bowl). 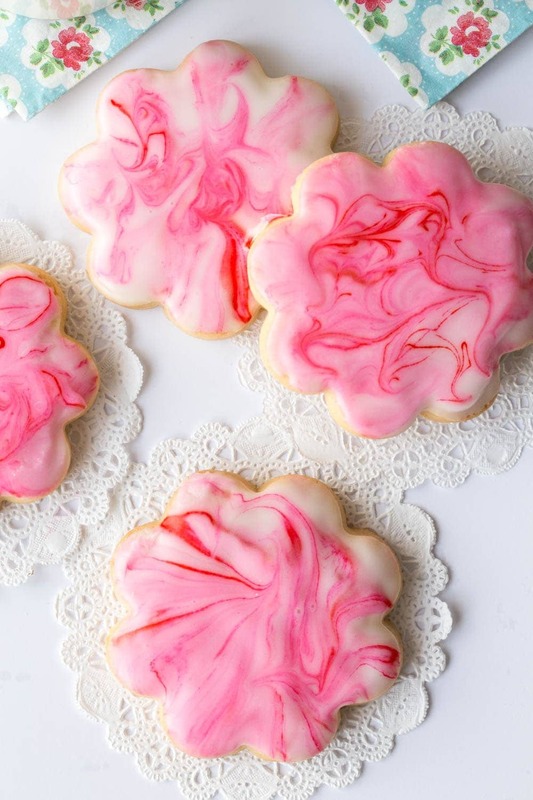 With a toothpick, add a small amount of gel food coloring and stir all through the icing in circular movements to form a swirly pattern. 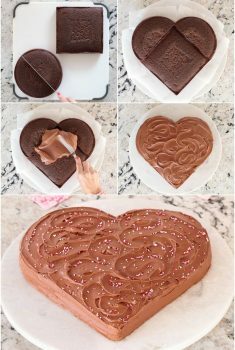 Don’t stir too much or the icing will become a solid color. Use a light hand with the gel food coloring. A little goes a long way! Dip one cookie at a time into the glaze. 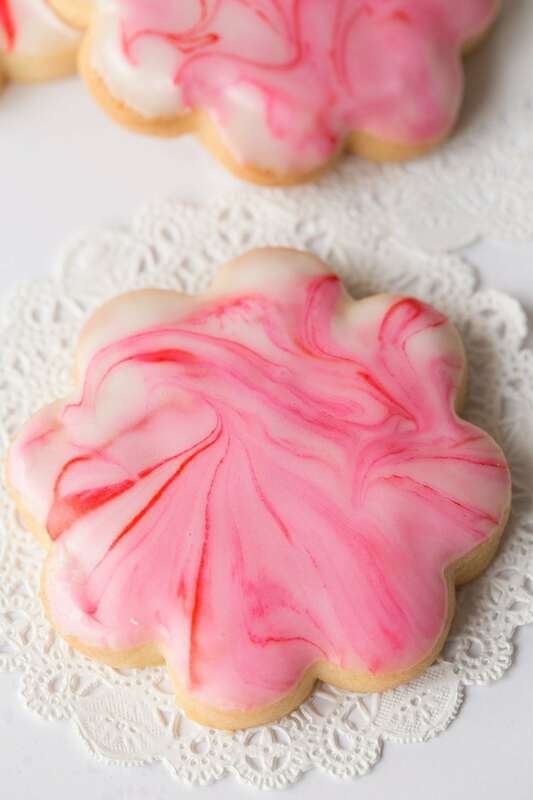 Let the cookie sit on the top of the glaze and gently push down at all the edges to ensure the surface of the cookie is covered with the glaze. 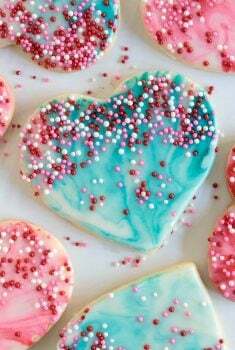 With your thumb and forefinger, pull the cookie out of the glaze and allow the excess icing to drip off. Then quickly flip the cookie right side up and give it a gentle jiggle to allow the glaze to flow evenly over the surface. Repeat with remaining cookies. Add more of the white glaze to the bowl when needed (stir well before adding). 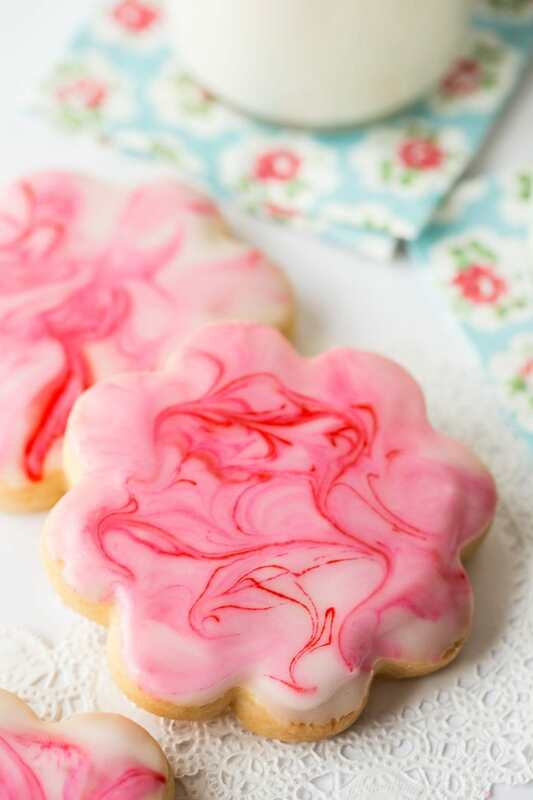 Use a toothpick to swirl more food coloring through the glaze any time the swirly effect is getting lost. You may need to add a few more drops of milk if the glaze gets too thick. Just stir it in well and add a little more food coloring to restore the swirly effect. 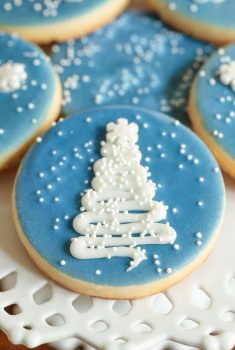 Allow the cookies to sit on a wire rack for a least one hour to “set” the icing. 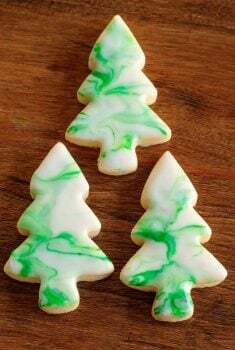 Once the icing is set, cookies can be stacked in an airtight container with wax paper or parchment paper between the layers. Thank you for letting us know Lori! So happy these turned out well for you. I would love to see a picture. You can email me at chris@thecafesucrefarine.com. Don’t give up Kay! It might take a bit of practice but you’ll be a pro before you know it. Regarding the recipe, my recipes are ever evolving and I’m always trying new ones in an effort to find “the best”. I do like the latest on the best! Hi! I just made these cookies for the first time and they came out absolutely perfect! Thanks for the thorough instructions. I will be making these every year from now on. Probably more often than that, haha! Thanks for sharing your results, Erika!